Overall, the number of books read by both genders increased over the period shown. By contrast, although women were shown to read more books than men at the beginning of the period, the number of books men read surpassed the one of those read by women in the last two years. In 2011, men perused approximately 3,000 books, which was about 2,000 less fewer than the figure for women. Over the following three years, although both genders read more and more books per year, the number of books read by men rose more rapidly, overtaking the figure of female readers in 2013 when the two graphs met at roughly 10,000 books. 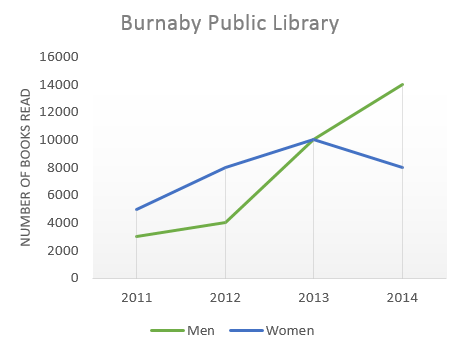 By 2014, whereas the number of books read by men at Burnaby Public Library continues to read more books, peaking to peaked at just under 14,000, women readers became less active with as far as the number of books read at only 8,000. falling by 2000 ones.